2012 was probably my most productive costuming year, yet. I ended up making one final costume. In preparation for the 30th anniversary of Return of the Jedi, I wanted to make a costume from that film. A bunch of us in the Nordic Base had agreed on making Endor Rebel Troopers, but I also wanted to make Endor Leia. Technically it's the costume that she wears at the briefing scene before going down to Endor, since I haven't made the poncho for Endor yet. This also shows how much comfortable I am with sewing than anything else. 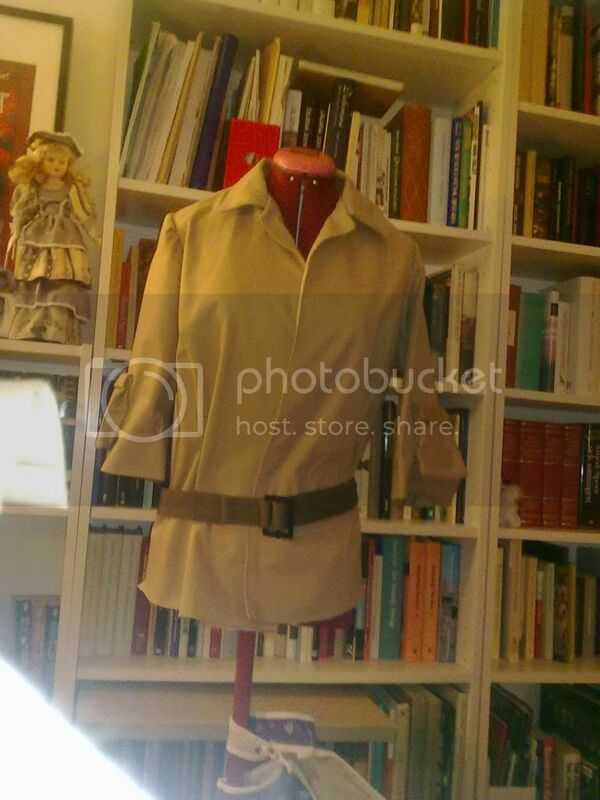 The Endor Rebel Trooper is basically a costume made up of ready-to-wear items, that just need some camouflage paint but I still finished Leia quicker, even though that involved sewing the pants, the blouse and the vest from scratch. I can't really say what patterns I used, both the trousers and the shirt were copied from the sewing magazine Ottobre Woman. The trousers are in a light blue stretch twill, and I must say that wasn't easy to find, but in the end I found it on ebay. This was my first ever pair of fitted trousers and it worked quite well. I've also sewn a piece of elastic that I can put under each foot to make sure that the trousers don't move up the legs. For the golden stripe along the leg I first used shiny satin ribbon, but I didn't like that. I upgraded the costume for Celebration Europe II when I simply cut a long piece of a dull, but gold coloured, fabric I had in my stash and sewed it on instead. One difference between the original costume and my trousers are that I also had to add in darts in the back. I simply have to take a lot more curve into account than the person who did the costume for Carrie Fisher. The shirt was also a pattern from Ottobre Woman. The most important thing when I looked for the pattern was that I needed a pattern with the correct collar shape, all other things could be fixed. Leia also has two pockets, one on each sleeve, and I followed the instructions that I found on this site. The pattern that I used was very similar to the pattern on that site as well. The finished shirt looks really good, but the fabric is quite warm and doesn't breathe. For the vest I used the pattern for the shirt, but I removed the collar and the darts. I then freehanded where the stitchlines should be. All the seams on the vest are purely decorative in my version. Finding fabric for the vest was one of the thing that finally made me give up on ever finding a good fabric in any of the two fabric stores in town. I went in and asked if they had any twill fabric, and the people looked at me as if I was crazy. In the end I had to make do with an old grey bedsheet that I flatlined to grey hobby felt to give it some weight. If there is one thing I'd like to redo on this costume it's the vest. I've studied the original a bit more and realised that some of my decorative stitching should actually be seams for a pocket, and I would like to do it in a better fabric. To make the hairstyle I took my Leia wig, that I had bought for the cinnamon bun hairstyle. I divided it into four parts and braided them. Those braids where then looped in a figure 8-pattern at the nape of the neck. I have to put it quite low or else my own hairline would be visible. I then took some loose hair and made two single braids. Those two braids are then pinned from under the figure 8-bun, over the crown of the head and then back under the bun. Leia can wear this hairstyles in two ways, either without or with a leather cord braided into the front braids. She has the leather cord in the hair in the scenes after she's been to the ewok village. The belt was picked up on ebay, the wrist communicator and the rank badge were made by two different friends. The boots were found at a local thrift store, I'm still on the lookout for black boots with a wood coloured heel though, and the blaster was made by a person who did a run of Leia blasters over at the Rebel Legion forums. 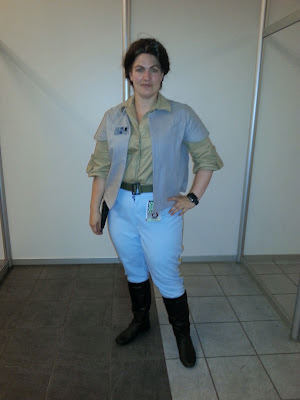 The I had it finished in December 2012, unfortunately those pictures disappeared when my computer crashed in January, but I wore the costume to Celebration Europe II in July 2013. For CEII I had upgraded the costume to a new stripe on the legs, my first was a shiny satin ribbon, this new is made from a duller fabric. 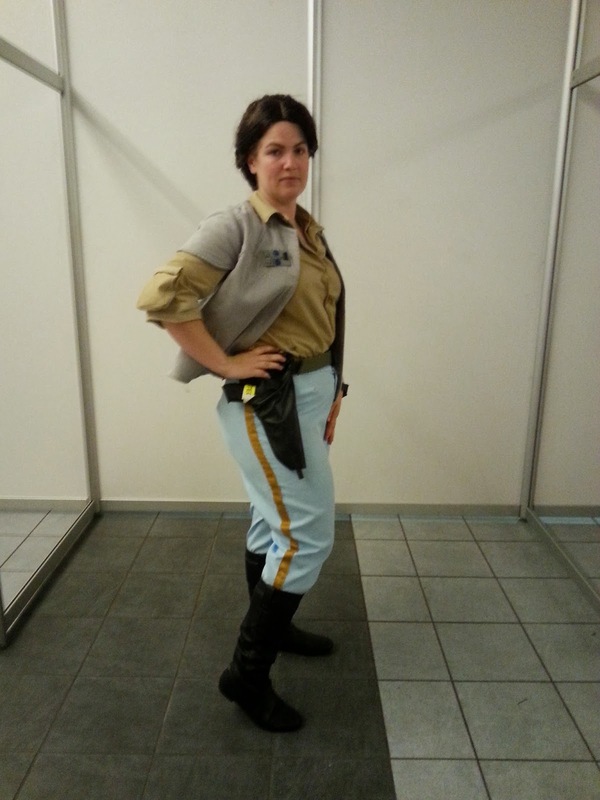 When I wore it at CEII it was heatwave, so ignore my sweaty and blank face, and that my wig didn't stay on properly. In fact I almost got a heatstroke from wearing this much clothes and a wig that day, thankfully my hotel was close enough that I could rush home, drink a lot of water and take a really long, cold shower. The holster and the pockets are made out of faux leather and without any real patterns. If I learn how to work with leather it would be great to upgrade them to proper leather instead. This is a very comfortable costume, but to be honest I always feel very self-conscious when I wear it. I feel as if people are staring and judging that I don't have the same bodytype as Carrie Fisher. I'm happy to wear it in a group of other Endor rebels, but it's not as fun to wear when I'm on my own. The pictures below are from Celebration Europe II, unfortunately I had a computer crash just when I had finished the costume in 2012 so I lost most of my construction pictures and pictures of the original finished costume. I look a bit tired and blank because these pictures are taken during a 30 degree day in Germany, and I'm wearing a full wig, leather boots and two layers of warm clothing. In fact after this photo I more or less had to rush over to my hotel and take a shower because I was on my way of getting a heatstroke.